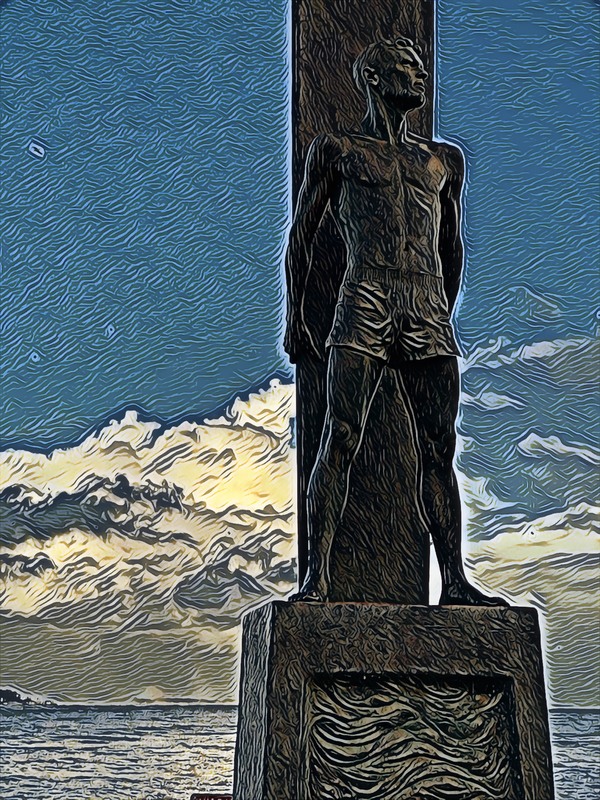 This is a digitally modified photograph I took of the Surfer Monument that stands near Lighthouse Point on West Cliff Drive in Santa Cruz, California. The monument is an 18 foot bronze statue commemorating all surfers and erected in May, 1992. The statue was created by classical sculptor Thomas Marsh. Brian Curtis, Marsh’s former student, designed the base and Santa Cruz surfboard shapers David Stewart and Bill Grace designed the 1930’s longboard that stands behind the surfer. The monument was commissioned to celebrate the passing of one of the original members of the Santa Cruz Surfing Club, Bill Lidderdale, Jr.
Near the base of the monument is a bronze memorial dedicating Santa Cruz as a World Surfing Reserve. Imparted in 2012 by the Save the Waves Coalition, this honor distinguishes a 7-mile stretch of surfer- and wildlife-friendly coastline running from Pleasure Point to Natural Bridges State Park. This designation, used to “proactively identify, designate and preserves outstanding waves, surf zones and surrounding environments around the world,” made Santa Cruz the fourth World Surfing Reserve, part of an elite assembly that includes Malibu Beach, Manly Beach in Australia, and Ericeira in Portugal.